At 1 pm AEST Tuesday, Ex-Tropical Cyclone Owen, with central pressure 998 hPa was located over the Coral Sea near latitude 15.6 south longitude 154.9 east, which is about 530 km east of Willis Island and 990 km east of Cairns. Ex-tropical cyclone Owen has turned westward and weakened rapidly in the past 6 to 9 hours. Recent observations suggest the system has now weakened below tropical cyclone intensity. 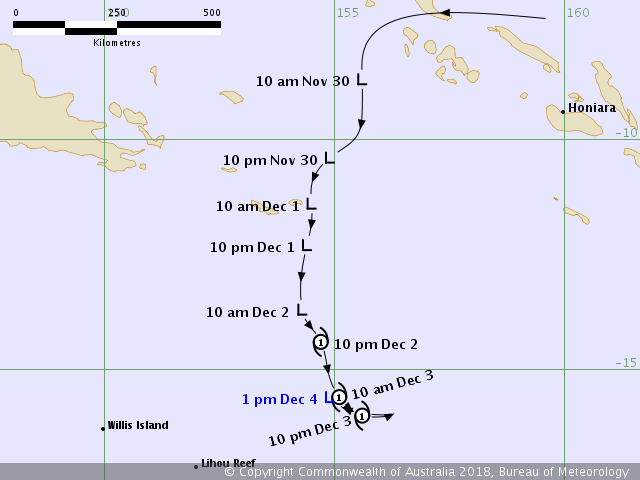 The remnants of ex-tropical cyclone Owen may continue to move west towards the east tropical and/or central Queensland coasts later this week. This could result in heavy rainfall developing about the central and east tropical coasts late in the week, though there remains a large amount of uncertainty associated with the movement of the system. We will continue to monitor this system and advise of any further developments. Tropical Cyclone Owen, category 1, with central pressure 995 hPa was located over the northern Coral Sea near latitude 15.6 south longitude 155.1 east, which is about 555 km east of Willis Island and 1010 km east of Cairns. Tropical cyclone Owen has continued moving south-southeast during the past few hours. Owen is expected to intensify further and is likely to reach Category 2 later today. 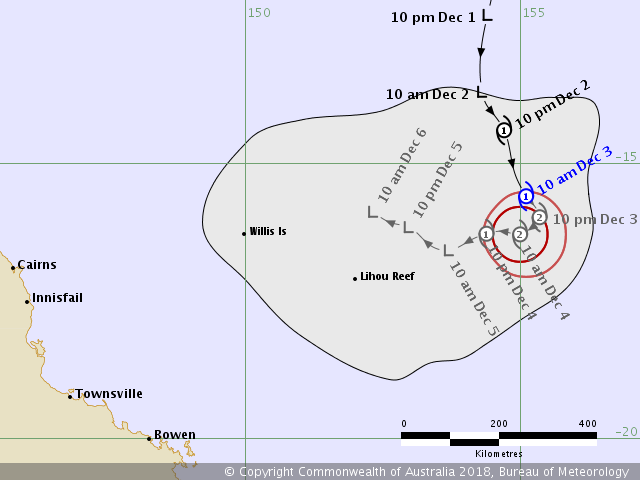 Tropical cyclone Owen is expected to slow and turn westward later tonight or early Tuesday morning. It should begin to weaken during Tuesday. 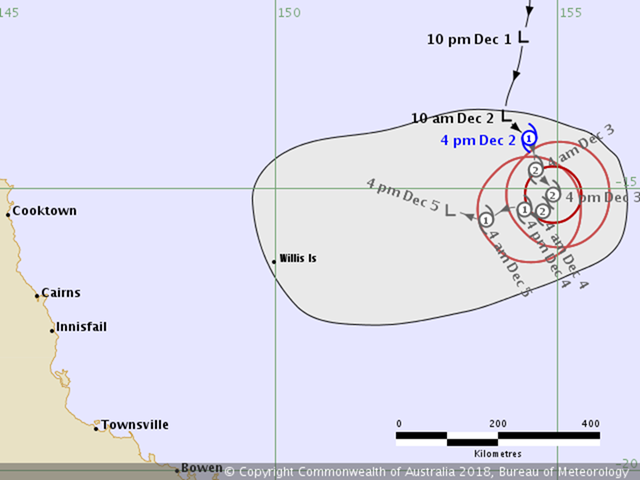 The cyclone should be relatively slow moving, and poses no immediate threat to the Queensland coast. It should remain well off the coast until it weakens later in the week. 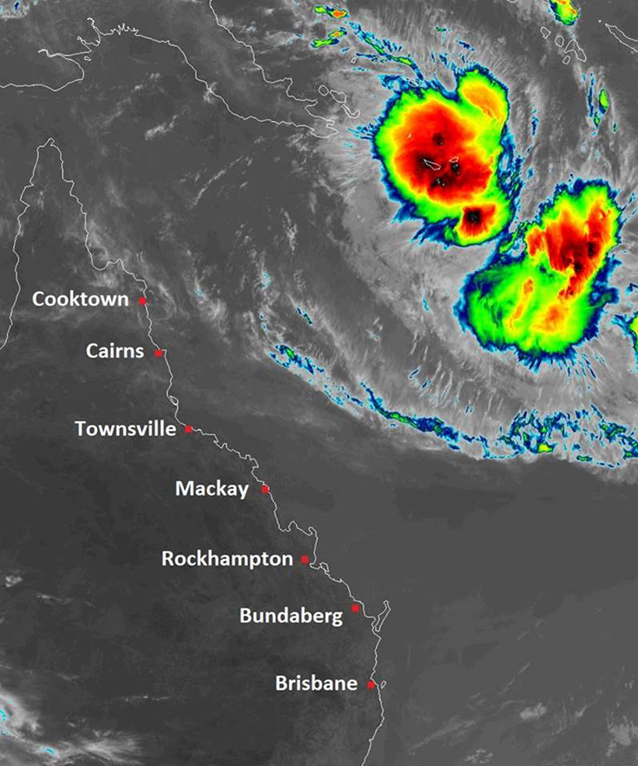 The tropical low over the northern Coral Sea has recently developed into Tropical Cyclone Owen. The system has been moving to the south southeast through today, but has recently slowed to around 8 kilometres per hour. Owen is expected to deepen further overnight and is likely to reach Category 2 on Monday. At 4 pm AEST Sunday, Tropical Cyclone Owen, Category 1, with central pressure 998 hPa was located over the northern Coral Sea near latitude 14.1 south longitude 154.5 east, which is about 545 km east northeast of Willis Is and 990 km east northeast of Cairns. The system is likely to drift slowly south until Monday afternoon or evening, and is then expected to turn and move slowly to the west and commence a weakening trend. This system poses no immediate threat to the Queensland coast, and should remain well off the coast until it weakens later in the week.